1 The Bolivarian Republic of Venezuela has been the full official title of the state since the adoption of the 1999 constitution, when the state was renamed in honour of Simón Bolívar. 3 The Constitution also recognizes all indigenous languages existing in the country. Venezuela ( IPA: [ˌvɛnɪˈzweɪlə]; Spanish: Venezuela, IPA: [beneˈswela]) is a country on the northern coast of South America. Comprising a continental mainland and numerous islands in the Caribbean Sea, Venezuela borders Guyana to the east, Brazil to the south, and Colombia to the west. Trinidad and Tobago, Curaçao, Bonaire, Aruba, and the Leeward Antilles lie just north of the Venezuelan coast. A former Spanish colony, Venezuela is a federal republic. Historically, Venezuela has had territorial disputes with Guyana, largely concerning the Essequibo area, and with Colombia concerning the Gulf of Venezuela. Today, Venezuela is known widely for its petroleum industry, the environmental diversity of its territory, and its natural features. Christopher Columbus was so enthralled by Venezuela's landscape, when arriving to its coast in 1498, that he referred to the land as Tierra de Gracia (Land of Grace), which has become the country’s nickname. The name Venezuela is believed to have originated from the cartographer Amerigo Vespucci who, together with Alonso de Ojeda, led a 1499 naval expedition along the northwestern coast's Gulf of Venezuela. Upon reaching the Guajira Peninsula, the crew observed the distinctive stilt villages ( palafitos) that the indigenous Añu people had built over the water. This reminded Vespucci of the city of Venice (Venezia in Italian); as a result the region was named Veneziela. Some argue that this actually meant Little Venice, later evolving to Venezuela. Other historians (notably Francisco Herrera Luque), noted that the Spanish suffix -zuela usually has a pejorative meaning (e.g., mujerzuela, cazuela) and sustain the thesis that the name more implied the notion of a second-rate Venice. On the other hand, the Spanish geographer Martín Fernández de Enciso, a member of the same crew, says in his work Summa de Geografía that the aforementioned population was called Veneciuela, and that it was built on a large, plain rock. According to this theory, the name Venezuela could be a native word. Nevertheless, the first account remains by far the most popular and accepted version of the origin of the country's name. Venezuela was first colonized by Spain in 1522. Indeed, the Spanish Empire's first permanent South American settlement was in what is now Cumaná. Most of Venezuela eventually became part of the Viceroyalty of New Granada; portions of eastern Venezuela became part of New Andalusia. After a series of unsuccessful uprisings, Venezuela — under the leadership of Francisco de Miranda, a Venezuelan who was a marshal in the French Revolution — declared independence from Spain on July 5, 1811. However, full sovereignty over Venezuelan territory was only achieved after Simón Bolívar, El Libertador, aided by General José Antonio Páez and especially the then General Grand Marshall Antonio José de Sucre, whose battle plan Bolívar chose to follow, won the Battle of Carabobo on June 24th 1821, and after José Prudencio Padilla won the Naval Battle of Lake Maracaibo on July 24th 1823. 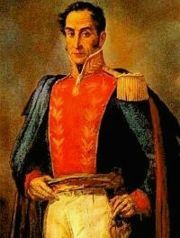 New Granada's congress gave Bolívar control of the Granadian army, he then led several countries to freedom and created a new republic called Colombia (also known as Great or Greater Colombia to differentiate it from the Republic of Colombia) consisting of what are now Colombia, Panama, Ecuador and Venezuela. He then led the army towards the south, liberating Peru and founding Bolivia (named after the Libertador, formerly a part of Peru, known as 'Alto Peru') from the Spaniards. Antonio José de Sucre, who won many battles for Bolívar, was to become his natural successor, until he was murdered in Berruecos. Venezuela became, after the war of independence, along with Colombia and Ecuador, part of the Republic of Gran Colombia (República de Gran Colombia) until 1830, when the country separated through a rebellion led by José Antonio Páez and declared itself a sovereign republic. Páez became the first president of Venezuela. Much of Venezuela's 19th- and early 20th-century history was characterized by political instability, political struggle and dictatorial rule. Following the death of Juan Vicente Gómez in 1935 and the temporary demise of caudillismo (authoritarian rule), democratic struggles eventually forced the military to withdraw from direct involvement in national politics in 1958. Since that year, Venezuela has enjoyed an unbroken tradition of democratic civilian rule, though even this has not been without conflict. Venezuela is member of the South American Community of Nations ( SACN). The National Assembly Building in downtown Caracas. The Venezuelan president is elected by vote, with direct and universal suffrage, and functions as both head of state and head of government. The term of office is six years, and a president may be re-elected to a single consecutive term. The president appoints the vice-president and decides the size and composition of the cabinet and makes appointments to it with the involvement of the legislature. The president can ask the legislature to reconsider portions of laws he finds objectionable, but a simple parliamentary majority can override these objections. The unicameral Venezuelan parliament is the National Assembly or Asamblea Nacional. Its 167 deputies, of which three are reserved for indigenous peoples, serve five-year terms and may be re-elected for a maximum of two additional terms. They are elected by popular vote through a combination of party lists and single member constituencies. The highest judicial body is the Supreme Tribunal of Justice or Tribunal Supremo de Justicia, whose magistrates are elected by parliament for a single 12-year term. The National Electoral Council (Consejo Nacional Electoral, or CNE) is in charge of electoral processes; it is formed by five main directors elected by the National Assembly. Venezuela abolished the death penalty in 1863, making it the country where this practice has been outlawed the longest. Venezuela is divided into 23 states (estados), a capital district (distrito capital) correspondent to the city of Caracas, the federal dependencies (dependencias federales) and Guayana Esequiba (border dispute/Guyana). Venezuela is further subdivided into 335 municipalities (municipios), and further subdivided into 1,084 parishes (parroquias). Note: The Venezuelan Federal Dependencies are not a real state, but a special territorial subdivision. Andean - Barinas, Mérida, Táchira, Trujillo; Páez Municipality of Apure. 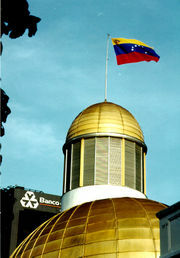 Capital - Miranda, Vargas, Capital District (Caracas). Central - Aragua, Carabobo, Cojedes. Central-Western - Falcón, Lara, Portuguesa, Yaracuy. Guayana - Bolívar, Amazonas, Delta Amacuro. Insular - Nueva Esparta, Federal Dependencies. Llanos - Apure (excluding Paez Municipality), Guárico. North-Eastern - Anzoátegui, Monagas, Sucre. Angel Falls (Salto Ángel), the world's highest waterfall, in Canaima National Park. At 916,445 km² (353,841 mi²), Venezuela is the world's 33rd-largest country (after Nigeria). It is comparable in size to Namibia, and is about half the size of the American state of Alaska. Mainland Venezuela rests on the South American Plate; its Caribbean islands were formed by subduction at the margins of the bordering Caribbean Plate. With 2,800 km of coastline, Venezuela is home to a wide variety of landscapes. The extreme northeastern extensions of the Andes reach into Venezuela's northwest and continue along the northern Caribbean coast. There, the nation's highest point, Pico Bolívar, is found. The country's centre is characterized by the llanos, extensive plains that stretch from the Colombian border in the far west to the delta of the Orinoco River in the east. To the south, the dissected Guiana Highlands is home to the northern edge of Amazonia and Angel Falls, the world's highest waterfall. Venezuelan forests are being depleted at the rate of 200,000 ha per annum by logging and shifting cultivation. The country can be further divided into nine geographical areas, some corresponding to the natural regions, one being the Andes Range. The Lake Maracaibo region comprises the lowlands near the Gulf of Venezuela. The Coro System, a mountainous block in the northwest, is home to several sierras and valleys. The Central Range runs parallel to the coast and includes the hills surrounding Caracas; the Eastern Range, separated from the Central Range by the Gulf of Cariaco, covers all of Sucre and northern Monagas. The Llanos region makes up a third of the country's area above the Orinoco River. Under it, is the South Orinoco Region (the Guianas, above described). 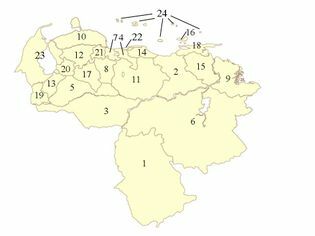 The Insular Region is formed by Nueva Esparta and the Federal Dependencies. The last geographical region is the Deltaic System which forms a pantanous triangle, covering Delta Amacuro, with the Atlantic platform branching off the coast. Pico Bolívar (c.5000m) in Mérida is Venezuela's highest mountain. The Orinoco River is the largest and most important river of the country, originating in one of the biggest watersheds in Latin America. Other important rivers are the Caroní and the Apure. The local climate is tropical and generally hot and humid, though moderate and cold in the highlands. The capital, Caracas is also the country's largest city. Other major cities include Maracaibo, Barquisimeto, Valencia, Maracay, and Ciudad Guayana. Venezuela is one of the seventeen megadiverse countries, for the great number of animal and vegetable species that habitate there. The petroleum sector dominates the Venezuela's mixed economy, accounting for roughly a third of GDP, around 80% of export earnings, and more than half of government revenues. The oil sector operates through the government-owned Petroleos de Venezuela (PDVSA), which among other things owns the US-based distributor CITGO and its more than 14,000 retail gasoline outlets. Despite the significant oil wealth, 50% of the population live in poverty, and thousands are unemployed. Venezuela is also highly dependend on its agricultural sector. Sectors with major potential for export-led growth are production of both coffee and cocoa crops. At one time, Venezuela ranked close to Colombia in coffee production, but in the 1960s and 1970s, as petroleum temporarily turned Venezuela into the richest country in South America, coffee was relegated to the economic back burner. Today, Venezuela produces less than 1% of the world's coffee, most of it consumed by the domestic market. However, Venezuelan coffees are again entering the North American specialty markets. Venezuela's cocoa industry has decayed since the days of Spanish colonialism, when African slaves worked on cocoa estates. The focus of cocoa cultivation has long since moved to tropical West Africa. In recent years, there has been an attempt to resuscitate this industry, as its rare variety of cacao, known as Chuao, is considered the finest and most aromatic in the world and is used in certain single-origin chocolates. The largest Venezuelan fine chocolate producer is El Rey, though some companies such as Savoy ( Nestlé) also manufacture chocolate from Venezuelan cacao and export it to Europe. Venezuela is one of the five founding members of OPEC, the international oil cartel. The initiative of Juan Pablo Pérez Alfonzo, OPEC was proposed in 1960 as a response to low domestic and international oil prices. Since 2005, Venezuela has been a member of Mercosur, joining Brazil, Argentina, Paraguay, and Uruguay; it has yet to gain voting rights. Caracas, the capital city of Venezuela. A recent study on racial groups showed that 60% of the population are Mestizo (mixed race between white, African and indian), 29% white (mostly Spaniards, Italian, Germans and Portuguese), 8% African, 1% Amerindian and 2% Asian (China, Japan, Vietnam, Korea, and the Middle East ). The Venezuelan people comprise a combination of heritages. The historically present Amerindians, Spanish colonists and imported African slaves were joined by sponsored European groups and others from neighbouring countries in South America during waves of immigration in the 20th century. There are also various communities from Eastern Europe such as Czech Republic, Poland, Romania, Ukraine, Lithuania, Latvia, Bulgaria, Croatia and Hungary. About 85% of the population live in urban areas in the northern portion of the country. While almost half of Venezuela's land area lies south of the Orinoco river, this region contains only 5% of the population. The national and official language is Spanish, but about 31 other indigenous languages also exist ( Wayuu, Pemon, Warao, Kariña, Yanomami, Guajibo, etc), as do languages introduced by immigrants. 96% of the population is at least nominally Roman Catholic. Around 4% of the population adheres to other faiths. The Teresa Carreño Cultural Complex at Caracas. Infant mortality in Venezuela stands at 21.54 deaths per 1000 births, for comparison this rate is almost eight times higher than Sweden. Child malnutrition (for children under age five) stands at about 17 percent of the population classified as stunted or wasted, which are the official United Nations categories for malnutrition. Areas more affected by the stunting and wasting include some of the poorest populations: Amacuro Delta (30%) and Amazonas (24%). According to the United Nations, the fraction of population without adequate sanitation is 32 percent, with a majority of people in many rural areas lacking in this basic commodity. Travellers to Venezuela are advised to obtain vaccinations for a variety of diseases including typhoid, yellow fever, cholera, hepatitis A, hepatitis B and hepatitis D. In a cholera epidemic of contemporary times in the Orinoco Delta, Venezuela's political leaders were accused of racial profiling of their own indigeneous people to deflect blame from the country's institutions, thereby aggravating the epidemic.. Visitors to Venezuela are advised to drink only bottled water, due to the prevalence of cross contamination of drinking water with untreated sewage. In Venezuela only three percent of the sewage receives treatment, and none of the following major cities have any wastewater treatment: Caracas, Maracaibo and Valencia. There are approximately 5,000,000 people in Venezuela living without access to safe drinking water, resulting in a percentage of population ranking of Venezuela among the poorest in South America. As of the year 1999 there were an estimated 110,000 people in Venezuela living with HIV. Worship of the Virgin of the Valley, Isla Margarita. Venezuela's heritage, art, and culture has been heavily influenced by the historical evolutions of its Latin American counterparts. These elements extend to its historic buildings, architecture, art, landscape, boundaries, and monuments. Venezuelan culture has been shaped by indigenous, Spanish, and African influences dating at early as the colonial period. Before this period, indigenous culture was expressed in art ( petroglyphs), crafts, architecture ( shabonos), and social organization. Aboriginal culture was subsequently assimilated by Spaniards; over the years, the hybrid culture had diversified by region. Venezuelan art is gaining attention within and outside the country. First dominated by religious motives, in the late 19th century it changed to historical and heroic representations, led by Martín Tovar y Tovar. Modernism took over in the 20th century. Some remarkable Venezuelan artists include Arturo Michelena, Cristóbal Rojas, Armando Reverón, Manuel Cabré, Jesús-Rafael Soto, Carlos Cruz-Diez (who both contributed greatly to kinetic art) and Yucef Merhi. 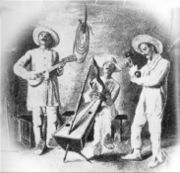 Venezuelan Joropo. Drawing by Eloy Palacios (1912). Venezuelan literature began developing soon after the Spanish conquest, and it was dominated by Spanish culture and thinking. Following the rise of political literature during the Independence War, then came Romanticism, the first important genre in the region, whose great exponent was Juan Vicente González. Although mainly focused on narrative, poets also figure with great importance, Andrés Eloy Blanco being the most famous of them, and also Fermín Toro. Major writers and novelists are Rómulo Gallegos, Teresa de la Parra, Arturo Uslar Pietri, Adriano González León, Miguel Otero Silva and Mariano Picón Salas. Another great poet and humanist was Andrés Bello, besides being an educator and an intellectual. Other philosophers and intellectuals, like Laureano Vallenilla Lanz and José Gil Fortoul, along with many other writers, sustained the theory of Venezuelan positivism. The great architect of the Venezuelan modern era was Carlos Raúl Villanueva, who designed the Universidad Central de Venezuela, (a World Heritage Site) and its Aula Magna. Venezuelan architectural examples are the Capitol, the Baralt Theatre, the Teresa Carreño Cultural Complex, and the General Rafael Urdaneta Bridge. Indigenous musical styles are sort of a crucible of Venezuelan cultural inheritances, most exemplified by groups like Un Solo Pueblo and Serenata Guayanesa. The national musical instrument is the cuatro. The typical or representative musical styles are mainly from the llanos area and its surroundings, such as Alma Llanera (by Pedro Elías Gutiérrez and Rafael Bolivar Coronado), Florentino y el Diablo (by Alberto Arvelo Torrealba), Concierto en la llanura by Juan Vicente Torrealba, and Caballo Viejo (by Simón Díaz). The Gaita (music style) is also a popular style, played generally during Christmas, typical of the Zulian region. The national dance is the joropo. Teresa Carreño was a world famous piano virtuosa during the late 19th century. Venezuela is also known for their world famous baseball players, such as Luis Aparicio, who is in the Baseball Hall of Fame in Cooperstown, New York (USA), David Concepción, Oswaldo Guillén, Andrés Galarraga, Omar Vizquel, Luis Sojo, Bobby Abreu, and Johan Santana, winner of the Cy Young Award in 2004 and 2006. Although baseball is tremendously popular (it's the national pastime), football (soccer) is also gaining popularity, due to the increasing performance of the Venezuela national football team. January 6 Día de Reyes Epiphany Christian feast, the visit of the three Magi to Jesus. From Palm Sunday to Easter Semana Santa Holy Week Commemoration of the Passion and Resurrection of Christ. July 24 Natalicio del Libertador Birth of Simón Bolívar Also tagged as Navy's Day. August 3 Día de la Bandera Flag Day Previously, in Venezuela the Flag Day was celebrated in March 12, until August 3, 2006, in honour of the disembarkation of Francisco de Miranda in La Vela de Coro, 1806. October 12 Día de la Resistencia Indígena Day of Indigenous Resistance Previously, in Venezuela the holiday was called Día de la Raza, conmemorating the arrival of Christopher Columbus to the Americas. November 17 to November 19 Feria de la Chinita Feria of La Chinita Only in the Zulian region; celebrating the miracle of Our Lady of Rosario of Chiquinquirá. December 8 Inmaculada Concepción Immaculate Conception Celebrating the preservance of Mary, the mother of Jesus from the original sin by the Grace of God. December 24 Nochebuena Christmas Eve Birth of Jesus (Divino Niño). The National Flower is the orchid (Cattleya mossiae). This kind of orchid is also known as Flor de Mayo (May Flower). It was first discovered in the northern land in 1839 and was given the status of National Flower on 23 May 1951. 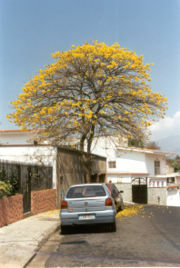 The National Tree is the araguaney (Tabebuia chrysantha). Called aravanei by the caribes, it can be found mostly in regions with temperate weather. It can reach a height between 6 and 12 m. The araguaney flourishes within the period following a rainy season, mostly in the first months of the year. Rómulo Gallegos referred to these months as "La primavera de oro de los araguaneyes" (the golden spring of the araguaneyes). Declared National Tree on 29 May 1945. The National Bird is the turpial (Icterus icterus). Fully coloured with yellow-orange tones except in the head and the wings, which are black with a few tones in white; also has a blue spot surrounding the eyes. It can be found in woods, the llanos, at the shores of jungles, and in northern and southern Orinoco. The turpial is fairly appreciated due to its singing and was declared the National Bird on 23 May 1958.